What Is Fundamentally Wrong With The 2014 Budget? The economic fundamentals overtly appear strong in the 2014 budget with the objectives of reducing the debt rate, budgetary deficit and sustaining a reasonable growth rate. That is when we look at the budget from a conventional economic point of view or a ‘bourgeoisie’ stand point, to be more precise. But what is the point of a budget in a developing country like Sri Lanka if it doesn’t address the key challenges in the socio-political system, not to speak of any socialist or progressive objectives? This article focuses on the budget’s implications on the provincial council system or the country’s fiscal devolution. Let me begin with some general points. It is unfortunate that a UPFA budget which is expected to be progressive in its social content has almost completely lost its social direction – neglecting social equity, fair distribution of income and upliftment of the poor and the needy. The UPFA talked about a ‘caring society’ in the last budget and it has now been completely dropped. 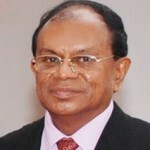 All in all, if the President’s speech, as the Minister of Finance, at the last budget kept some semblance of traditional SLFP-Left policies or his almost bygone ‘pro-poor’ orientation, the speech this time is a mark contrast and it contains only glorified financial notes and figures perhaps from the Department of National Budget of the Treasury without any sense of direction for the people or the country except casino-type growth. There are many vantage points from which the current budget could be critiqued, including major flaws in economic (miss)management or fiscal policies. There is no doubt that Sri Lanka is in a favourable position, particularly after the end of the war, to utilize the advantages accruing from the Asian growth, being next to India, and linked to China’s economic resurgence. However, it is doubtful whether the present regime is utilizing the full potential of this undisputable advantage, given the self-interests of the ruling elite and the increasingly disdainful attitude towards the general masses and the provincial/regional development. As many have already pointed out, the present budget is ineffective in attracting enough Foreign Direct Investment (FDI), as it could have been, or reforming the tax structure to utilize the full potential of the domestic capital formation, ‘not from the poor’ but from the rich. Most of the present taxes are indirect taxes burdening the poor. Be as it may, the present article focusses, however, its attention on seemingly untouched area of complete abandonment of fiscal devolution which could have been a cornerstone of a developmental budget at this stage of social development in the country both addressing the spatial inequity in general and the question of ethnic and social reconciliation in particular. It is possible that fiscal devolution is largely an unfamiliar concept in Sri Lanka. It is more possible that financial mandarins at the Ministry of Finance are averse to the concept. But it has been there in practice since the 13th Amendment (1987) and even it took expression at least in some form at the last budget and its speech. It is completely absent from the present budget speech or in any tangible form in the budgetary planning documents except crude figures given for the allocations under the Ministry of Local Government and Provincial Councils. Let me first quote what it said in the last budget by the President himself. Hon. Speaker, Rs. 130 billion has been allocated in this Budget for development activities in the education, health, social service and provincial economic activities that are devolved on Provincial Councils. To broaden the sources of income of the Provincial Councils, it is expected to allocate Rs. 32 billion from the income derived through Nation Building Tax, Stamp Duty and Motor Vehicle Registration. As such, it has been ensured that the Provincial Councils could spend around Rs. 162 billion in 2013. The above is not the only statement on fiscal devolution for the Provincial Councils in the last budget. There was a complete section on the subject titled “Provincial Council Activities.” But the above statement is quite sufficient to understand what was there until the present budget in terms of fiscal devolution, at least in circumscribed manner. While the President promised budgetary allocation of Rs. 130 billion from the government income at the national level, another 32 billion was allowed through sharing taxes at the provincial level. These included NBT, Stamp Duty and MVR. All these seemed to be scrapped. Why I say “in circumscribed manner” is that even by the last budget, arrangements had been made to collect the taxes through the central agencies and then allocate the estimated amounts to the PCs. This is not the fiscal devolution intended under the 13th Amendment. Fiscal devolution proper incorporates both expenditure and income within the devolved units as much as possible. This is what is in practice in India, South Africa or China, not to speak of Canada, USA or Australia. Fiscal devolution or decentralization has nothing much to do with federalism or unitary state under contemporary circumstances. It is sine qua non in any country with major regional disparities or under development. It is of paramount importance when power and governing functions are devolved. If one argues that fiscal devolution is applicable only in large countries, then the counter examples are from Switzerland or Belgium. In countries or socio-political systems, like among living beings, human or animal, the anatomy is the same whether the country is big or small. It should also be noted that although the last budget talked about 162 billion for the Provincial Councils, the present revised estimate is 148 billion for the current year (2013) and by the end of the year, it would prove to be much less. There must have been a drastic cut somewhere, most probably in the tax revenue sharing. 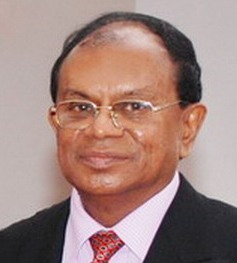 And for the coming year (2014) what can be seen is purely an allocation for the Ministry of Local Government and Provincial Councils and through which, of course as in the past, funds would be transferred to the respective Provincial Councils as an appendage of the central Ministry and controlled by the Treasury. This appears to be the dominant thinking of financial centralization at present, instead of what intended as financial devolution under the 13th Amendment mediated through the Finance Commission. Under the Ministry of Local Government and Provincial Councils, 148 billion is allocated for the 9 Provinces for the year 2014 without any policy reference in the budget speech. I believe the omission is by purpose and indicative of how the government is going to treat the provincial councils in the future. This is exactly the reduced amount for the current year, from the promised 162 billion, even after the (re)constitution of the Northern Provincial Council in September this year. There is clear callousness in the budget estimates for the provincial councils, or otherwise the two figures could not have come that close as if the figures are largely duplicated or even manipulated. This allocation also contrasts quite significantly with what is allocated to the Ministry of Defence and Urban Development which amounts to over 270 billion. Instead of reconciliation through devolution, the big stick of military might has taken priority and instead of provincial/regional development, urban development in the Western Province and provincial cities of particularly the South has taken priority. Out of the allocated amount of 148 billion, 111 billion is for recurrent expenditure and only 37 billion is for much needed capital and development expenditure. Even out of the recurrent expenditure, the major bulk of 94 billion is for personal costs (i.e. salaries) and the rest, 17 billion is limited for operational costs. There is obviously something fundamentally wrong in these estimates and allocations, making the principles of devolution a mere mockery. However, in theory, there are 35 functions assigned to the provincial councils even after taking away the police and land functions. Among them, education, health, social services and provincial economic activities are of paramount importance and they will all suffer as a result. Most of the capital/development expenditure, yet meagre, which could be considered the backbone of any devolutionary system geared for rectifying regional disparities is allocated largely for politically induced projects that are called the Special Development Initiatives such as Pura Neguma etc. and are funded mainly by foreign sources with the goodwill of seeing some progress of devolution in the country. For example, Japan, Australia, ADB and WB are the main funders of these projects. 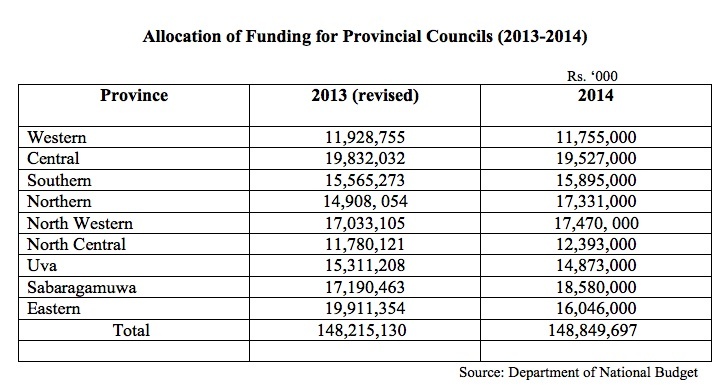 The following table gives overall budgetary allocations for the provincial councils for 2014 in contrast to 2013. What the above table signifies is that there is no tangible overall increase for the Provincial Councils from the last year and the difference is only 634,567 million which is not even sufficient to counter the inflation. After its constitution, the Northern Provincial Council is allocated an additional amount of 2.4 billion perhaps at the expense of the Eastern and other Provincial Councils. There are reductions for the Eastern, Central and Uva and sharp increases for the Southern and Sabaragamuwa whatever the reasons. The ‘cut’ for the Eastern Provincial Council is a staggering (nearly) 4 billion. The very second sentence of the Budget Speech of the President has highlighted the importance of the end of the war and the establishment of provincial councils in the North and the East in the following words. There cannot be many qualms about that. Our nation is proud today that our Government has converted the once mined lands of the North and East into lands that harvest the dividend of peace and prosperity. The consolidation of the democratization process of the 30 year terrorist trapped North, having institutionalized a Provincial Council and Local Authorities in the province through free and fair elections, has further enriched the pride of our nation. However, the words have not been translated into deeds particularly in financial allocations to the Provincial Councils. The importance of Provincial Councils and fiscal devolution are multifaceted. ‘An effective system of financial devolution is necessary in the country for sustainable development with environmental care, minimize regional/provincial disparities and to bring redress to the people while enhancing the principles of ethnic/social reconciliation and democracy.’ I am almost quoting from a World Bank sponsored Report to the Finance Commission and the President submitted in August 2011. The provincial disparities are a key dilemma in Sri Lanka’s development challenge. These disparities have been the breeding grounds for insurgencies both in the North and in the South in socio-economic terms in the past. Uneven development in any country could create social upheavals in both ethnic and social terms. These upheavals cannot only be contained through military means. While the per capita income in the Western Province has gone apace during the last decade or so, it has been lagging tragically behind in other provinces. This is what is called kolambata kiri apata kakiri (milk and honey to Colombo and just forage to us). The temporary revival of economic activities in the North and the East cannot be reasons for complacence. If there has been any improvement in bridging the gaps in provincial disparities, as highlighted by some Central Bank reports recently, those are due to the devolution and provincial council system. The paragraph 3 of Article 154R of the Constitution or the 13th Amendment says “The Government shall, on the recommendation of, and in consultation with, the [Finance] Commission, allocate from the Annual Budget, such funds as are adequate for the purpose of meeting the needs of the Provinces.” This is the constitutional provision which is in fact violated by the 2014 Budget. In all countries where there is political devolution, or where there is fiscal devolution, there are targeted amounts of allocation to the provinces and these allocations as percentages of government revenue are progressively increased. China is a very good example. Sri Lanka is the only country that these allocations are now circumscribed and even decreased. Between 2000 and 2010, the government progressively increased the transfer of funds to the provinces from 32 billion to 107 billion according to the Central Bank statistics. Earlier, the percentage of transfer was lagging behind and was around 10 percent in 2008, but in 2010 it increased to almost 13 percent of the government revenue. The World Bank sponsored study report in 2011 recommended an increase, and the following was what it stated on the subject in essence. In 2010, central government transfers to provinces amounted to Rs. 107.03 billion which was only 13% of the total revenue of the central government in that year. In view of the importance of promoting regional development by allocating more resources for productive investment in the provinces, this proportion needs to be accelerated gradually to reach the level of at least 25%. What has happened instead is the reduction of overall allocation from 162 billion last year to 148 billion this year, and transfer of 130 billion from government revenue, which is mere 8.4 percent of the annual government revenue estimated to be around 1,100 billion in 2014. A political Scientist who knows every thing except he himself. Political Scientist? No. An “Unscientific Politician”? I asked you in 33 years 60% will be Muslims in Sri Lanka and the pve for that will be CASINO… you didnt ask me how? Muslims has to peak too, then only they start killing they themselves and others too. Our inhabitants thought you are paid adviser to old Julia’s party. Didn’t Bill Shorten give you an extension?. Thanks a lot for editing out. Sir Laksiri.Our lord Laksiri. Treble Doc Laksiri.What a wonderful human being!If any idiot tries insulting this intellectual,we will do the needful. Thanks CT. CT pl do me a favor.Any chance that i could have a drink with Sir Doc Laksiri and Lord Brian?Pl do that before these two wonderful human beings croak. Sorry Max, as you are edited out by CT. I don’t have any influence over the CT policies but believe they are governed by media ethics and common sense decency. Why do you want to insult others and call yourself an Idiot? If you have any contrary opinion, please express yourself with decency. Thanks for your advice.Ethics decency,eh?Rajapakse hora,Rajapakse war criminal,Jarapakse,Gota hora,yes ethics.Even the president’s wife is not spared.Yes next time i will call the Srilankan president hora(ethics)and i am sure that you will be thrilled.Of course the defeated Tamil terrorists along with their sidekicks will find me a decent guy.Yes,i do agree that that not only the Srilankan president,but the whole family should be handed over to the Para Suddas,most probably the Hague.The crime being,getting rid of that wonderful human being His worship V Prabakaran!Here after you will be Sir Laksiri. The yapping chorus…right on cue ! It’s all getting rather pathetic boys . The problem with this budget is that it is not based in the reality that exists and is instead based in the minds of economists and accountants that have very little if any connection with this reality. It is a budget for global investors. Investors who use Sri Lanka as a base on which to run operations for a global market will make money. Investors who manufacture or service the local market will not make money. So far the environment has been co operative and so that the 31% who produce the agricultural output meant to feed 69% of the population have been able to survive if not flourish. Anyone who takes the trouble to dig into what is going on in the Asian Center for Disaster Management will learn very fast that the weather patterns over Sri Lanka are shifting so that soon rains will miss all our catchment areas. What are we investing in responding to this development? Or are we still holding on to the position that there will be no climate change in Sri Lanka? Anyone heard of the Philippines? Heard abut Katrina? The recent storm in India? Sandy in New York? Ah of course. These were all movies right? Like the day after tomorrow. I have never seen a population that is so ignorant of what is happening in the world and YET claims a high level of literacy! What does the budget say about responding to these types of events? So, why you people did not talk before the budget ? At that time, you all were crying out loud about CHOGM. Don’t you think you people are just pathetic whiners ? All provinces get Rs. 148b, that is 12% of total Gov expenditure which is Rs. 11,000b. Laksiri forgot to mentioned SL Finance minister got approval for President fund of Rs. 84b. This is MR’s expenditure, this comes to Rs.10m per hour. It is funny, MR is the finance minister and he approved this Rs.84b for his own expenditure as President and it is about 15% increment from his last year expenditure. Gotha get Rs. 287b, but this include salaries of 200,000 soldiers +CMC employees. Looters and racists under the guise of elected officials and with the help of sheeple are taking the national economy for a ride. The Sri Lankan economy is like a runaway train with psychopaths at the wheel. Politicians want to fill their own pockets and leave the country to the next generation to meet debt obligations. We can analyse theoretically but in practice elected officials in power will loot the nation dry. That’s what fundamentally wrong and unacceptable. The finance minister – a.k.a the president,had to find US $150 Million to prop up two ‘black holes’ known as Sri Lankan Air and Mihin Air which have already gobbled many billions ever since they were created. Tax on food items among other imports has been increased to find the money. and is the first planter to become chairman of two airlines. It is simply one educated in politics criticizing politicians. Not enough learning in politics. Instead of talking finances, he should have talked about political aspects of it. Hi Jim. Your view that I shouldn’t have talked about finances being a political scientist is erroneous. We are increasingly living in an interdisciplinary academic world. But this has also been the case since time immemorial. Aristotle called political studies a master science. Kautilya talked about politics with economics in his Arthashastra. All academic disciplines are interdependent, some more and some less. This is not the first time I have seen this narrow view expressed by you. If your concern is about I am making mistakes by venturing outside my academic discipline then that should be pointed out by criticising the errors or mistakes or counter posing my view. But you have not done so. Of course you are free to express your view whatever it is. But isn’t it odd to express a view how others should or shouldn’t have expressed their views? People should be completely free to express their views whatever the subject, without breaching ethical rules. This is a basic freedom of expression. By the way, my first degree was in Economics (Honours) including finance and accountancy. My last substantive position before retirement was Senior Professor in Political Science and Public Policy (University of Colombo). It was not just political science but public policy. I was also a Director of the Colombo Stock Exchange (CSE) appointed by the Minister of Finance from which I resigned later. These are just facts. Therefore, even from your narrow point of view my article is within my competence. But I express my views simply as a concerned citizen and individual. I am also not a faceless person! Everything is wrong in Rajafucksa budget. It gives too much to Tamilians and nothing to Muslims.